Background: The potential benefits of earlier referral to a nephrologist of patients with elevated levels of serum creatinine include identifying and treating reversible causes of renal failure, slowing the rate of decline associated with progressive renal insufficiency, managing the coexisting conditions associated with chronic renal failure and facilitating efficient entry into dialysis programs for all patients who might benefit. Methods: A subcommittee of the Canadian Society of Nephrology, which included representatives from family practice and internal medicine, conducted a MEDLINE search for the period 1966 to 1998 using the key words referral and consultation, dialysis, hemodialysis, peritoneal dialysis, renal replacement therapy and kidney diseases. Where published evidence was lacking, conclusions were reached by consensus. Guidelines: Earlier referral to nephrologists of patients with elevated creatinine levels is expected to lead to better health care outcomes and lower costs for both the patients and the health care system. All patients with newly discovered renal insufficiency (as evidenced by serum creatinine elevated to a level above the upper limit of the normal range of that laboratory, adjusted for age and height in children) must undergo investigations to determine the potential reversibility of disease, to evaluate the prognosis and to optimize planning of care. All patients with an established, progressive increase in serum creatinine level should be followed with a nephrologist. Adequate preparation for dialysis or transplantation (or both) requires at least 12 months of relatively frequent contact with a renal care team. Nephrologists should provide consultation in a timely manner for any patient with an elevated serum creatinine level. In addition, they should provide advice about what aspects of the condition require particularly urgent or emergency assessment. Sponsors: This clinical practice guideline has been endorsed by the Canadian Society of Nephrology and the College of Family Physicians of Canada. Meeting, teleconference and travel expenses of the Referral Guideline Subcommittee were covered by The Momentum Program, a collaboration between Baxter Corp. and Janssen-Ortho Inc. However, the authors are solely responsible for the editorial content of this article. The virtual epidemic in Canada of end-stage renal disease (ESRD), which is increasing in prevalence by approximately 10% annually, [1, 2] has made it difficult for Canadian provincial governments to provide adequate resources to meet growing needs for treatment. [3–5] The Canadian Society of Nephrology recently endorsed a policy document entitled Principles of End Stage Renal Disease Care,  a document that raised concern about inappropriate rationing of ESRD therapy in Canada. Its authors argued for facilitation of early referral to dialysis centres, as well as predialysis education and efficient entry into ESRD treatment programs for those who choose to undergo dialysis or kidney transplantation. A similar philosophy is increasingly being adopted in other jurisdictions. For example, the US National Institutes of Health consensus conference on morbidity and mortality associated with dialysis  stated that an important goal of appropriate care is early referral to a multidisciplinary renal team. In this way, interventions may be initiated that will allow for the timely, elective creation of access for dialysis (such as an arteriovenous fistula or graft or insertion of a catheter for peritoneal dialysis), to prevent the need for urgent commencement of dialysis and the associated prolonged stay in hospital. Because all of this pre-dialysis care can be accomplished on an outpatient or day-surgery basis, the savings to the health care system may be substantial. The potential benefits of early referral to a nephrologist include identifying and treating reversible causes of renal failure, slowing the rate of decline associated with progressive renal insufficiency and managing the multiple coexisting conditions associated with chronic renal failure. In addition, with their knowledge of the expanded acceptance criteria for modern renal replacement therapy and an understanding of the tasks and time required to prepare a patient for ESRD therapy, nephrologists are uniquely placed to facilitate efficient entry into dialysis programs of all patients who might benefit. A referral subcommittee, including a general internist and 2 family physicians, of the Canadian Society of Nephrology's Professional and Public Policy Committee was created in 1996. A MEDLINE search was performed for the period 1966 to 1998 with the key words referral and consultation, dialysis, hemodialysis, peritoneal dialysis, renal replacement therapy and kidney diseases. The search identified 112 articles. English-language articles and those judged to be related to referral criteria were chosen for further scrutiny. Additional relevant articles were identified from the reference lists of the identified articles or were suggested by the subcommittee members. There is no framework for grading evidence related to referral. Most of the evidence was found in retrospective case-control studies of lower quality than would be ideal. Where good evidence was lacking, issues were resolved by consensus. Earlier referral to nephrologists of patients with elevated serum creatinine levels is expected to lead to better health care outcomes and lower costs for both the patient and the health care system. Three prospective studies have examined multidisciplinary, intensive interventions applied to patients who were referred early. These studies have demonstrated better vocational outcomes,  delays in the onset of ESRD,  better values for homeostatic indicators, less use of temporary devices for vascular access and lower consumption of hospital resources  in these patients. Non-referral for dialysis is also a problem in Canada. The reported incidence of ESRD in Canada (which counts only patients treated with renal replacement therapy, not those who presumably die of untreated renal failure) is less than half that reported for the United States (104.1 per million in 1996  and 262 per million in 1995  respectively). Some of this difference may be related to non-referral of patients who might benefit from treatment. The survey of Ontario family physicians and community internists  showed that some patients with ESRD were not referred to a nephrologist and that non-referral was influenced by age and coexisting disease. For example, an otherwise healthy 85-year-old person with renal failure would have been referred for dialysis by only 65.9% of the physicians surveyed. Even more disturbing was the finding that an 85-year-old person with diabetes would have been referred by only 44.1% of the respondents. Finally, most of the physicians (62.4%) thought that dialysis was being rationed in Ontario at the time of the survey (1994; there was no rationing at that time), and even more (90.5%) predicted that rationing would occur in the future. Therefore, at least part of the reason for the difference in reported incidence of ESRD between Canada and the United States is non-referral of Canadian patients who could benefit from dialysis. In summary, it appears that earlier referral has the potential to lead to an improvement in coexisting diseases that begin in the pre-dialysis stage (e.g., left ventricular hypertrophy and renal osteodystrophy), a delay in the onset of ESRD, better patient survival, less use of temporary devices for vascular access, greater use of native arteriovenous fistulae (rather than synthetic grafts), an optimized biochemical, physical and psychological state on initiation of dialysis, better vocational outcomes and reduced health care costs. All patients with newly discovered renal insufficiency (as evidenced by serum creatinine elevated to a level above the upper limit of the normal range in that laboratory, adjusted for age and height in children), must undergo investigations to determine the potential reversibility of disease, to evaluate the prognosis and to optimize planning of care. Most patients with even mildly elevated serum creatinine levels have lost about 50% of their renal filtration function and already have mild to moderate renal insufficiency. These patients must usually undergo a variety of investigations (Figure 1, scenario A) to determine if reversible factors can be identified. For example, obstruction of the urinary tract is easy to diagnose with ultrasonography and is often amenable to urological intervention. In addition, many inflammatory renal diseases can be treated with immunotherapy if diagnosed before irreversible scarring occurs. A kidney biopsy is often required to establish the diagnosis and to guide therapeutic decisions. Figure 1. 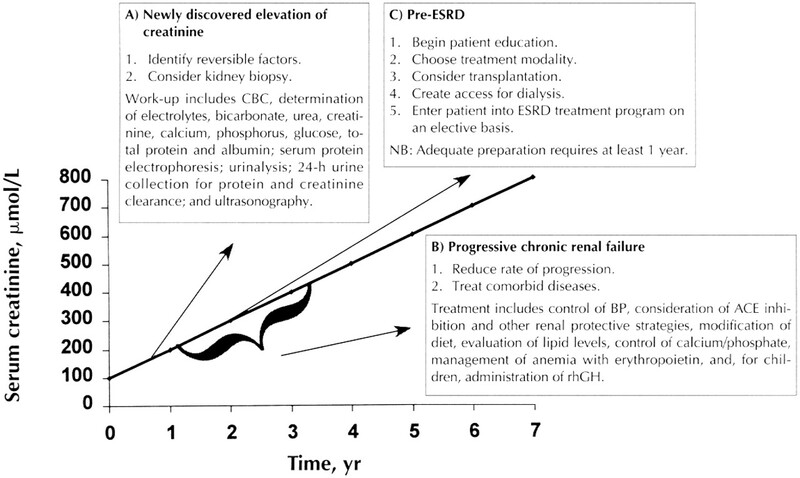 Approaches to diagnosis and treatment of patients with elevated levels of serum creatinine, at 3 stages of disease: newly discovered elevation of creatinine level (A), progressive chronic renal failure (B) and just before end-stage renal disease (C). The creatinine values and time course are hypothetical and are intended for illustrative purposes only. The thresholds for referral are lower for children than for adults. CBC = complete blood count, BP = blood pressure, ACE = angiotensin-converting enzyme, rhGH = recombinant human growth hormone, ESRD = end-stage renal disease. Many kidney diseases progress inexorably toward ESRD, through immune-mediated injury or through many non-immune-mediated pathways that ultimately lead to chronic fibrosis. Accurate and timely diagnosis and treatment can favourably alter the natural history of many of these diseases. Elevated levels of serum creatinine are often identified during investigation of other disorders in adult patients with hypertension, atherosclerotic disease, diabetes mellitus or unexplained anemia, in adults with known renal insufficiency, in adults with abnormal findings on urinalysis, and in infants and children who fail to thrive, feed poorly, or have recurrent vomiting, polyuria or episodes of dehydration. The upper limits of normal for serum creatinine are considerably lower in infants and children than in adults. The normal range of serum creatinine for children less than 5 years of age is 26 to 45 micro mol/L, and this normal range gradually increases from age 5 to adulthood. Elevation of serum creatinine is not a normal feature of ageing, nor is advanced age a contraindication to referral. Patients with rapidly increasing serum creatinine (e.g., a 20% increase over a matter of days, weeks or months) must undergo investigations (usually including kidney biopsy) on an urgent basis and should be referred promptly to a nephrologist. For this reason, for any newly discovered increase in serum creatinine, the test must be repeated to determine if the creatinine level is stable or rising. If it is rising, the nephrologist should be alerted to the fact that the referral is urgent (not elective) and should agree to see the patient soon. One possible exception to these guidelines is that patients with known stable, mild renal insufficiency, documented by serial determination of creatinine level over a period of a few years (especially if dipstick testing shows no hematuria or proteinuria), may be followed carefully, with particular attention to serial monitoring of blood pressure, protein excretion rate and kidney function, without referral to a nephrologist. All children with elevated levels of serum creatinine should be assessed by a pediatric nephrologist because of special problems related to growth, nutrition, and bone and metabolic disorders seen in children with even mild renal insufficiency. Concurrent care by the primary care physician and pediatric nephrologist can then be arranged. All patients with an established, progressive increase in serum creatinine level should be followed with a nephrologist. A recent British study showed that management of diabetic patients before referral to a nephrologist was not ideal, given that such patients were not likely to be receiving angiotensin-converting enzyme inhibitor therapy,  a strategy of proven benefit in diabetic kidney disease. Ifudu and colleagues  showed, in a prospectively evaluated inner-city cohort, that care prior to ESRD provided by a nephrologist was superior to both care provided by a non-nephrologist physician and no medical care at all. Optimal health outcomes are more likely if a nephrologist is involved in caring for these patients from the time creatinine elevation is discovered. Adequate preparation for dialysis or transplantation (or both) requires at least 12 months of relatively frequent contact with a renal care team. Any patient who is being followed concurrently by a nephrologist and the primary care physician, as outlined above, will be automatically offered the option of undergoing dialysis; if this type of therapy is desired, the patient will be prepared for dialysis as a matter of course. However, patients with known chronic, progressive renal insufficiency who are not being followed by a nephrologist and patients with newly diagnosed moderate or severe renal failure must be referred promptly. At best, a full year of relatively frequent visits are necessary to provide adequate education about dialysis, to help the patient choose the most suitable ESRD treatment modality, to plan elective creation of the dialysis access and to facilitate efficient entry into the dialysis program for those who choose this life-sustaining therapy (Figure 1, scenario C). For some patients, kidney donation from a living relative or nonrelated person can be considered; if carefully planned, this procedure may preempt the need for dialysis. Peer counselling of potential new patients by those already receiving treatment for ESRD can be helpful in many cases. To accomplish these goals, referral should occur, at the latest, when the serum creatinine level is 300 micro mol/L or higher or when creatinine clearance is less than 30 mL/min (0.5 mL/s), whichever situation is worse and sooner if the creatinine level is increasing rapidly. For children, referral should occur at much lower creatinine levels. A serum creatinine level of 150 micro mol/L in a 6- to 10-year-old child often reflects a glomerular filtration rate as low as 30 mL [middle dot] min-1 [middle dot] 1.73 m-2. For younger children, a level of 100 micro mol/L may signify loss of at least 70% of filtration function. Growth failure has been documented in children with glomerular filtration rates below 70 mL [middle dot] min-1 [middle dot] 1.73 m-2. This situation can be improved in certain renal disorders by sodium chloride supplementation, correction of acidosis, nutritional supplements and treatment with recombinant human growth hormone. It is important for primary care physicians to understand the acceptance criteria for modern dialysis so that they can refer patients appropriately. Most elderly patients undergoing dialysis perceive their quality of life to be good, and their life expectancy is often reasonable. [29–33] There are no longer any technical reasons why a competent, informed patient who might benefit from dialysis should not be referred for this treatment. Certainly an experienced multi-disciplinary pre-dialysis team, including physicians, nurses and social workers, can most accurately portray the prognosis and expectations for quality of life, so that truly informed decisions can be made. No Canadian provincial ministry of health has ever called for rationing of ESRD therapy. Ontario, Quebec and British Columbia have publicly affirmed the importance of access to ESRD therapy. [4, 34, 35] Notwithstanding these claims, availability of dialysis in Canada has not always kept up with demonstrated need,  a situation that has created difficulties in fulfilling the standard of accessibility. However, perceived resource constraints must not be used by physicians to justify refusal to refer suitable candidates for dialysis. Nephrologists should provide consultation in a timely manner for any patient with an elevated serum creatinine level. In addition, they should provide advice about what aspects of the condition require particularly urgent or emergency assessment. There are 332 practising nephrologists in Canada, providing 201 full-time equivalents of clinical service. A large portion of their collective time involves caring for dialysis and transplant patients. Most of these specialists practise in cities. For these reasons, elective appointments may be scheduled several months from the time of the initial request. This delay in scheduling an elective appointment for a patient with elevated creatinine level may create problems for the referring physician. First, the delay may unintentionally (and incorrectly) signal that the problem is not serious. Second, without specific instructions, the referring physician may not appreciate the definite indications that would warrant a request for urgent or emergency consultation. For example, urgent consultation is needed if the creatinine level is rising or if a creatinine level above 300 micro mol/L has been newly discovered. Emergency consultation might be warranted if, in addition to these criteria, the patient has systemic symptoms or severe homeostatic derangements such as overload of extracellular fluid volume, acidosis or hyperkalemia. If an appointment cannot be given promptly, the nephrologist should communicate with the referring physician, setting out clearly the indicators that might create cause for alarm and dictate the need for an early assessment. Application of these guidelines in rural settings may be a challenge. It is recommended that rural physicians establish a link with a nephrologist, who might perform a preliminary chart review to determine if or when a patient with elevated creatinine level should travel for a formal consultation and to give interim advice. However, it must be stressed that many rural patients can be treated by satellite- or home-based hemodialysis or by home-based peritoneal dialysis. Indeed, it may be possible for the nephrologist to work with the rural patient and the primary care physician to prepare the patient for dialysis while minimizing travel and disruption to the patient's lifestyle. Distance from a nephrologist or dialysis centre is not a sufficient reason for non-referral. Canadian Organ Replacement Registry, Canadian Institute for Health Information. 1997 annual report. Don Mills (ON): The Registry; 1997. Schaubel DE, Morrison HI, Desmeules M, Parsons DA, Fenton SSA. End-stage renal disease in Canada: prevalence projections to 2005. CMAJ1999;160(11):1557-63. Mendelssohn DC, Chery A, for Toronto Region Dialysis Committee. Dialysis utilization in the Toronto region from 1981 to 1992. CMAJ1994;150:1099-105. Ontario Legislative Assembly, Standing Committee on Social Development. Dialysis treatment in Ontario. Toronto: Government of Ontario; 1994. Kjellstrand CM, Moody H. Hemodialysis in Canada: a first-class medical crisis. CMAJ1994;150:1067-71. Mendelssohn DC, for Canadian Society of Nephrology Professional and Public Policy Committee. Principles of end stage renal disease care. Ann R Coll Physicians Surg Can1997;30:271-3. National Institutes of Health. Morbidity and mortality of dialysis [consensus statement]. Ann Intern Med1994;121:62-70. Mendelssohn DC, Kua BT, Singer PA. Referral for dialysis in Ontario. Arch Intern Med1995;155:2473-8. Eadington DW. Delayed referral for dialysis. Nephrol Dial Transplant1996;11:2124-6. Innes A, Rowe PA, Burden RP, Morgan AG. Early deaths on renal replacement therapy: the need for early nephrological referral. Nephrol Dial Transplant1992;7:467-71. Ratcliffe PJ, Phillips RE, Oliver DO. Late referral for maintenance dialysis. BMJ1984;288:441-3. Khan IH, Catto GR, Edward N, Macleod AM. Chronic renal failure: factors influencing nephrology referral. Q J Med1994;87(9):559-64. Jungers P, Zingraff J, Albouze G, Chauveau P, Page B, Hannedouche T, et al. Late referral to maintenance dialysis: detrimental consequences. Nephrol Dial Transplant1993;8:1089-93. Campbell JD, Ewigman B, Hosokawa M, Van Stone JC. The timing of referral of patients with end stage renal disease. Dial Transplant1989;18:660-8. Sesso R, Belasco AG. Late diagnosis of chronic renal failure and mortality on maintenance dialysis. Nephrol Dial Transplant1996;11:2417-20. Schmidt RJ, Domico JR, Sorkin MI, Hobbs G. Early referral and its impact on emergent first dialyses, health care costs, and outcome. Am J Kidney Dis1998;32:278-83. Hood SA, Sondheimer JH. Impact of pre-ESRD management on dialysis outcomes: a review. Semin Dial1998;11:175-80. Obrador GT, Pereira BJ. Early referral to the nephrologist and timely initiation of renal replacement therapy: a paradigm shift in the management of patients with chronic renal failure. Am J Kidney Dis1998;31:398-417. Rasgon S, Schwankovsky L, James-Rogers A, Widrow L, Glick J, Butts E. An intervention for employment maintenance among blue-collar workers with end-stage renal disease. Am J Kidney Dis1993;22:403-12. Binik YK, Devins GM, Barre PE, Buttman RD, Hollomby DJ, Mandin H, et al. Live and learn: patient education delays the need to initiate renal replacement therapy in end stage renal disease. J Nerv Ment Dis1993;181:371-6. Levin A, Lewis M, Mortiboy P, Faber S, Hare I, Porter EC, et al. Multidisciplinary predialysis programs: quantification and limitations of their impact on patient outcomes in two Canadian settings. Am J Kidney Dis1997;29:533-40. US Renal Data System (USRDS), National Institute of Diabetes and Digestive and Kidney Diseases. USRDS 1997 annual data report. Bethesda (MD): National Institutes of Health; 1997. Challah S, Wing AJ, Bauer R, Morris RW, Schroeder SA. Negative selection of patients for dialysis and transplantation in the United Kingdom. BMJ1984;288:1119-22. Sesso R, Fernandes PF, Ancao M, Drummond M, Draibe S, Sigulem D, et al. Acceptance for chronic dialysis treatment: insufficient and unequal. Nephrol Dial Transplant1996;11:982-6. Barrett BJ. Managing progressive renal disease before dialysis. Can Fam Physician1999;45:977-84. Ellis PA, Reddy V, Bari N, Cairns HS. Late referral of end stage renal failure. Q J Med1998;91:727-32. Meltzer S, Leiter L, Daneman D, Gerstein HC, Lau D, Ludwig S, et al. 1998 clinical practice guidelines for the management of diabetes in Canada. CMAJ 1998;159(8 Suppl):S1-S29. Ifudu O, Dawood M, Homel P, Friedman EA. Excess morbidity in patients starting uremia therapy without prior care by a nephrologist. Am J Kidney Dis1996;28:841-5. Grapsa I, Oreopoulos DG. Practical ethical issues of dialysis in the elderly. Semin Nephrol1996;16:339-52. Ismail N, Hakim RM, Oreopoulos DG, Patrikarea A. Renal replacement therapies in the elderly: Part 1. Hemodialysis and chronic peritoneal dialysis. Am J Kidney Dis1993;22:759-82. Kjellstrand CM. High-technology medicine and the old: the dialysis example. J Intern Med1996;239:195-210. Kutner NG. Psychosocial issues in end-stage renal disease: aging. Adv Ren Replace Ther1994;1:210-8. Winchester JF, Rakowski TA. End-stage renal disease and its management in older adults. Clin Geriatr Med1998;14:255-65. BC Ministry of Health. BC Renal Council strategic plan. Victoria: The Ministry; 1997. Ministre de la Sante et des Services sociaux and Association des nephrologues du Quebec. La dialyse et son organization. Vol 1. Quebec City: Gouvernement du Quebec; 1995. Hollomby DJ. Manpower issues outside the U.S.: Canada looks at its supply of nephrologists. Nephrol News Issues1998;12:15-7.